One of the inherent advantages of using an Intermediate Bulk Container (IBC) is that it permits the homogeneous blending of multiple ingredients without the need to transfer the material to and from another machine. This eliminates any segregation and cross contamination issues. Our line of Bin Blenders permits the easy loading of the IBC without a forklift. After blending, the IBC can be lifted and positioned above a process for discharging via the use of one of our post lifts. The IEDCO Bin Blender is designed to receive, lock, lift and blend an IBC. The Bin Blender is completely electrically powered. The completely electric design makes the machine more reliable, trouble‐free and smoother operating than either hydraulic or pneumatically powered units. There is no leakage, no motion creep and far less maintenance. Our Bin Blender’s safe and elegant design allows for easy loading without the use of a forklift. 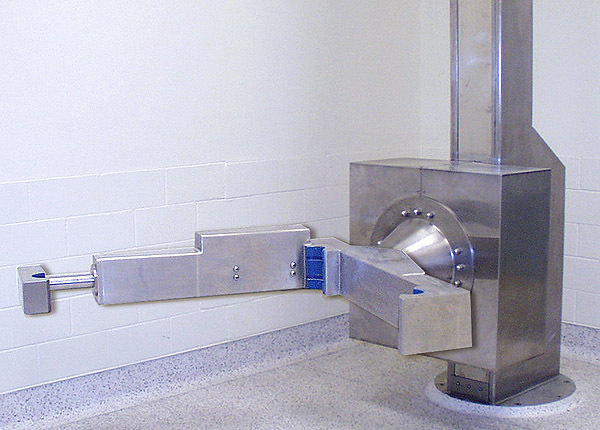 The unique clamping arm is simple, hygienic, and safe. The one adjustable arm is opened for loading. The IBC containers are fit with “male” collet rings on the four legs. 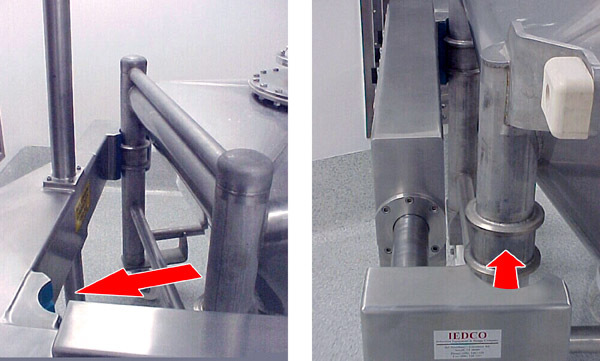 The rings of one leg are positioned in “female” inserts of the stationary arm and the IBC is simply pivoted into place. The adjustable arm is locked and the IBC is now safely secured at three corners and ready for blending. Able to handle multiple sizes of IBC containers. The ability to obtain a homogeneous blend of multiple ingredients in an IBC without mechanical intrusion. The transfer of product to and from another machine is eliminated. Containment and ergonomic situations are greatly improved. The unique clamping arm is simple, hygienic, and safe.